Iranian authorities have raided the house of the country's best-known dissident, Akbar Ganji, supporters and relatives of the jailed writer say. His daughter telephoned a family friend during the raid who described her as being "very terrified". Mr Ganji has been on a hunger strike for 59 days and both his lawyer and his wife have urged him to end the protest. 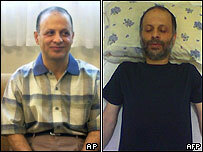 He was jailed in 2001 over articles linking Iranian leaders with a series of political killings in the 1990s. The BBC's Frances Harrison in Tehran says it is not clear why the authorities raided the house when Mr Ganji has not been there for months. The prosecutor's office may be planning to bring fresh charges or take legal action against his wife, who has been very outspoken about the case, our correspondent says. Correspondents have pointed out that the alleged raid on Mr Ganji's home coincided with Iranian Journalists' Day. There has been no confirmation from the authorities. Prominent reformist journalist Issa Saharkhiz is quoted as saying: "Ganji's daughter, who was very terrified, contacted me for help because she said some agents from the Tehran prosecution branch were searching their place". The European Union has urged Iran to release Mr Ganji on humanitarian grounds, but Tehran dismissed the request as illegal. On Saturday Mr Ganji's wife, Massoumeh Shafeih, begged friends and supporters to persuade him to end the hunger strike. She said she had not been able to see him for a week and having no news was destroying both her and the children. She said after her last visit that Mr Ganji's health had deteriorated and may only live for a few more days. Iran's Nobel Peace Prize winner Shirin Ebadi, who is his lawyer, also joined the appeal for him to end his hunger strike to save his life.